Between Heaven and Earth: a deeper look at the esoteric meaning of Tarot’s Princesses . Eastern philosophy describes the human being as standing “between Heaven and Earth” and sees the human body as a conduit of the qi of Heaven, poised between the above and the below, and surrounded by the four directions. The Dao, or the Way, was the original substance of Heaven, and Daoist masters regarded returning to Heaven as a prerequisite for unity with Dao: “Humans follow the way of Earth; Earth follows the way of Heaven; Heaven follows Dao, and Dao follows its own nature” (Laozi, chapter 25) The Tarot Princesses also occupy a unique position of the court cosmology, standing firmly by themselves, between Heaven and Earth, and representing our nature and our goal as humans more fully than any other card. They embody the axis mundi, the center of the world or pillar of the world tree, connecting the higher and lower realms. This axis mundi is also referred to as the world’s navel or omphalos, the central point of the world’s beginning. On the Tree of Life, the Princesses stand in Malkuth, the sphere of Earth where all spiritual journeys begin, leading up the path of the Universe seeking Kether. 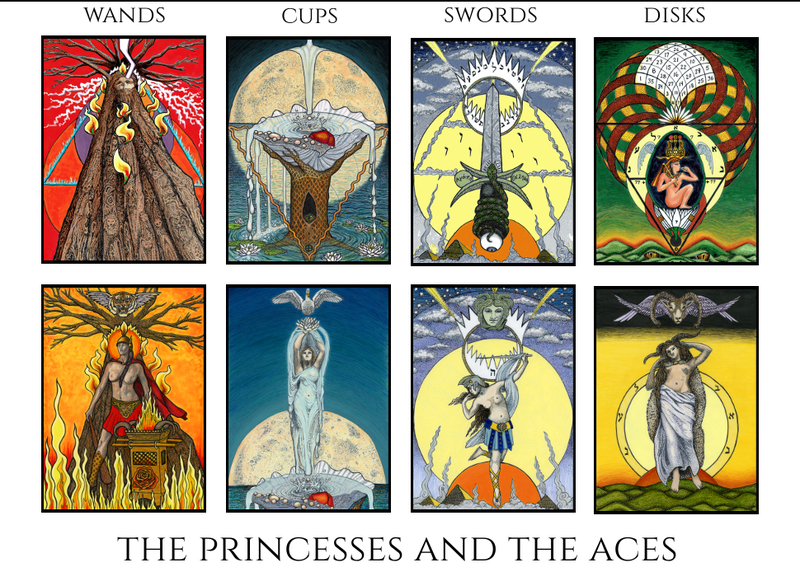 Like all court cards, the Princess cards of the tarot can represent people, either those we come in contact with, or aspects of ourselves conscious or unconscious, or they can refer to a situation. As people, they are elemental types, dynamic and whole unto themselves, those who are often described as “a force of nature”. They are often relegated to the status of youth, or of messenger. The Tarot Princesses are far more than just youthful messengers, but are often not given much attention. 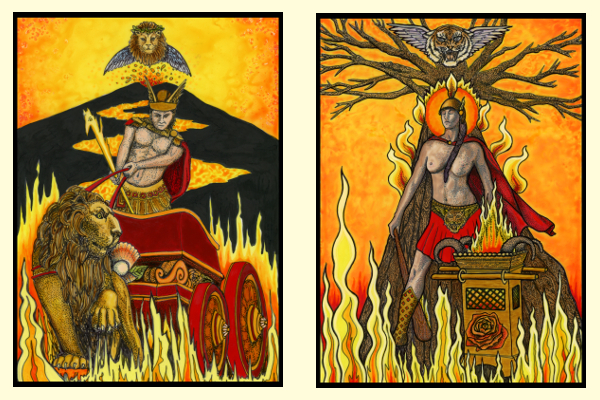 These may be the most misunderstood cards of the tarot court, and of the entire deck. Seemingly low ranked and inconsequential, these cards are among the most interesting and compelling of the pack. Of the four types of court cards, each represents the fourfold division of the element. The Princesses are each aspects of Earth; Earth as Fire, Earth as Water, Earth as Air, and lastly Earth as Earth. 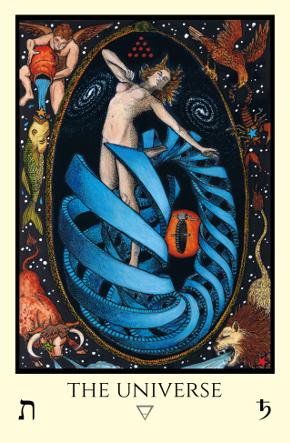 Esoterically they are simultaneously both low and high, as they are the most powerful worldly expression of their element and the youngest member of the court cards of the element. When dignified they contain the force of the Knight/King, the form of the Queen, and the power and beauty of the Prince, thus embodying all of the gifts of the celestial powers while standing firmly as themselves. Woe unto whomsoever shall make war upon her when she is thus firmly established! This is the story of how the Princess “awakens the Eld of the All-Father” or the Yod of the Old King. “Eld” is an archaic term for an age of the world, olden days, and for old age. Thus the Princess is the created thing and holds the key to the renewal of the cycle, in which one world proceeds to the next. 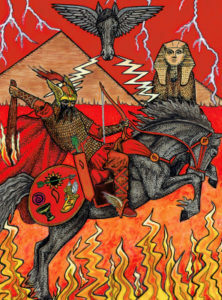 The Knights are the Father, and correspond to the Yod of the fourfold name, and the element of Fire. Their force is that of will; swift, inflaming, and initiating. Thus they are portrayed upon horseback, in full armor. On the Tree of Life they correspond to Chokmah, though as the Yod, they begin in Kether though they are not conscious of it. They are the first motion, and first force; the line that extends from the point, and the thrust of the first phallus. They are masculine and potent, but their male force is transient, expending itself quickly. 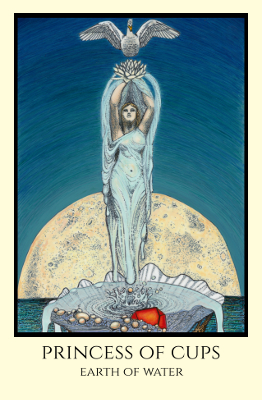 The Queens are the Mother, primal Hé of the divine name, and the element of Water. As the givers of form to the force initiated by the Knights, they are steady and receptive; abiding and reflecting. They incubate and gestate the seed, ordering and regulating what the Knight has started. Thus they are shown seated upon thrones, reflective and considering, and also armored. On the Tree of Life they correspond to Binah. They are counterpart to the Knight and exist as part of the Supernal triad above the Abyss. 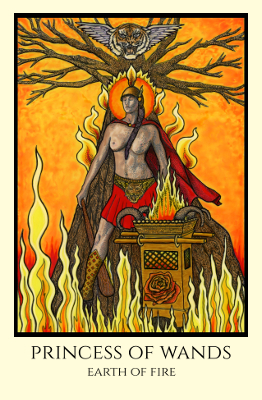 The Princes are the Son born of the love of his Supernal parents, the combination of Fire and Water yielding the intellectual element of Air. The Knight’s first urge and the Queen’s receptivity to his advances has resulted in the birth of the Prince, the Vau of the fourfold name. On the Tree of Life they correspond to Tiphareth, and provide a connection through which we can contact divinity. The Princes are the Holy Guardian Angel that we, as the Princesses, must unite with. As the heir of the Supernals, the opposing parental influences of force and form have here reached equilibrium. The main decanic cards of the Prince are also those of opposing forces, either side of two extremes. He inherits some of the swiftness of his father, though less transient, combined with the endurance of his mother, though more yielding. Thus the Princes are shown armored and borne upon chariots, being both rapid and enthroned. The power of the Prince is only valid if founded on and responsive to the two opposing forces within him. 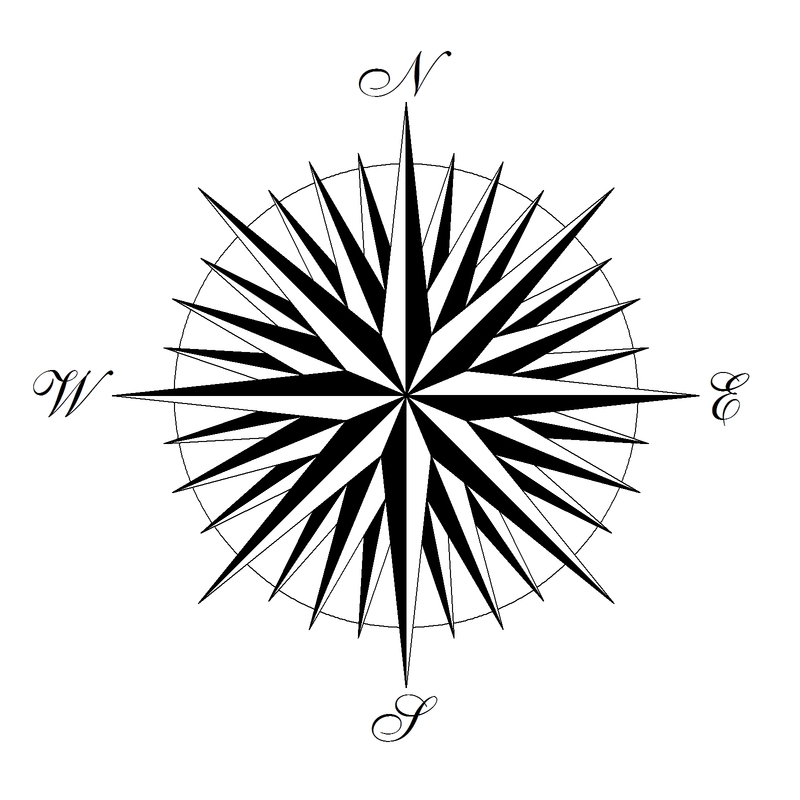 The Princes, as the Kerubic signs, are also carrying the powers of the four Royal Stars in four directions. They bring them to the Princesses, who must awaken and unite with the Prince in order to wield them. Thus the Prince’s function: “marriage” to the Princess, or where we as humans, the sleeping Princesses of fairy tales, wake up and connect with our divine Will and contact our beloved HGA. The Prince as the carrier of the force of his Father and the form of his Mother, carries the elemental power to the Princess. Only instilled in her is the power rightly wielded, as within her the three primary elements are alchemically combined as in an alembic, and brought to fruition. Yet the story is full of confusions and contradictions, as all things that attempt to describe any cycle involving the Supernals. In the Book of Thoth, Crowley writes: “The relations between these Four Elements of the Name are extraordinarily complex, quite beyond the limits of any ordinary treatise to discuss; they change with every application of thought to their meaning. For instance, no sooner has the Princess made her appearance than the Prince wins her in marriage, and she is set upon the throne of her Mother. She thus awakens the Eld of the original old King; who thereupon becomes a young Knight, and so renews the cycle. The Princess is not only the perfect Maiden, but, owing to the death of the Prince, the forsaken and lamenting Widow. All this occurs in the legends characteristic of the Aeon of Osiris. It is hardly possible definitely to disentangle these complications, but for the student it is sufficient if he will be content to work with one legend at a time.” The Princess is destined to become the Queen of Queens, set upon the throne of the Mother, or crossing the Abyss to the great sea of Binah. This archetypal story mirrors our highest human potential. If one pictures this division of “the Four Parts of the Celestial Heavens which lie around the north Pole” showing the Princess’ domain, the glyph of Malkuth and the astronomical symbol for the Earth is revealed: the quartered circle. 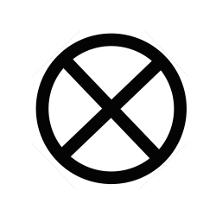 This is also a glyph or map of the astrology chart itself, with the axis of ascendant/descendant and MC/IC defined. The Princesses, unlike the other tarot courts who each have three minor cards (two decans from their principal sign, and one from their shadow decan), each encompass a full quarter of the decans, and three entire astrological signs: the fixed or kerubic sign of their element, plus the two surrounding it. Thus the four Princesses together encompass the whole zodiac, or the entirety of the Universe. 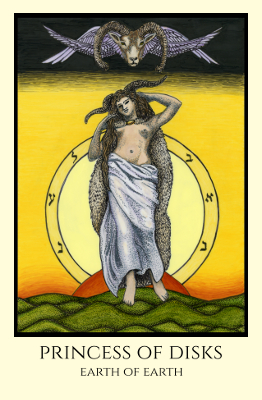 It is not a coincidence that the figure on the Universe card is depicted as a Maiden. From Book M: Liber Mundi: “The sign that each court is attributed is chosen so that the three Gunas are in balance. The three Gunas (Rajas, Sattva, Tamas) are components or divisions of Prakriti, Sanskrit for Nature. Prakriti corresponds to the Princesses. The Knights, which are Cardinal, Sulfuric, and Rajasic in nature, pick up the last ten degrees of a Fixed sign and are assigned the first twenty degrees of a Mutable sign. The Queens, which are Fixed, Salty, and Tamasic in nature, pick up the last ten degrees of a Mutable sign and are assigned the first twenty degrees of a Cardinal sign. The Princes, which are Mutable, Mercurial, and Sattvic in nature, pick up the last ten degrees of a Cardinal sign and are assigned the first twenty degrees of a Fixed sign. As we can deduce, the natures of each court are determined by the three decans of which the card is composed. Study of the minor arcana card for each of the three decans will yield much about their attributes. 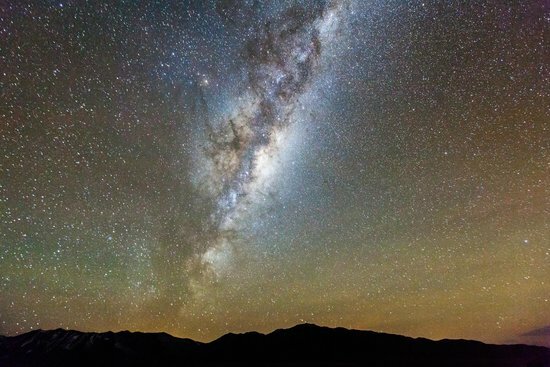 Some astrological knowledge will enhance your understanding of the courts, though even contemplation of the trumps associated with the astrological signs would be sufficient. 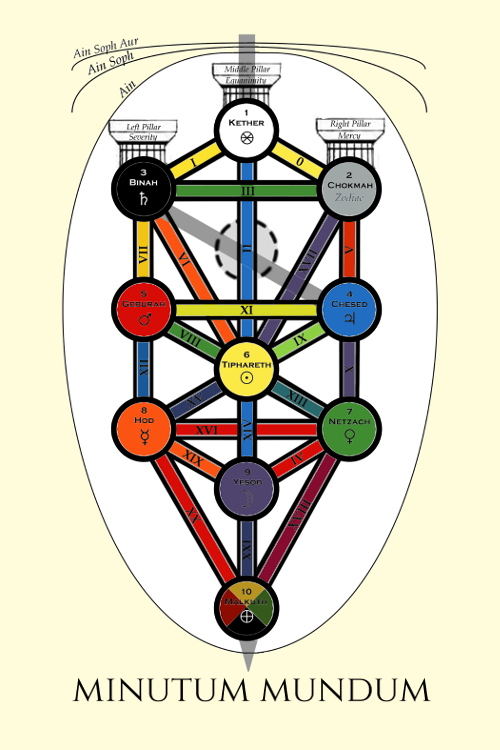 If the uppermost tip of the Yod in YHVH is Kether or the Ace, the Princess is the container below that holds it all as the final Hé and Malkuth. It is after all said that “Kether is in Malkuth, after another fashion”. 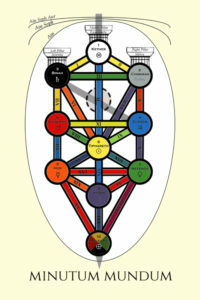 Even looking at a diagram of the Tree of Life, one can see that Malkuth (the Princesses) hold up the entire tree, with Kether (the Aces) at the top of it. 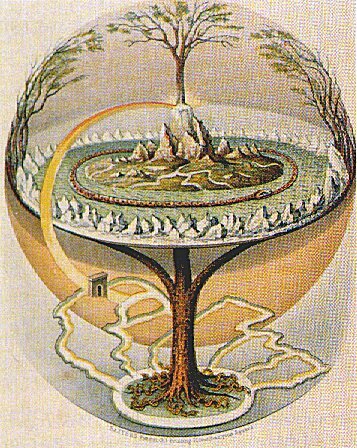 Yet this tree is upside down, for Kether is the root and Malkuth is the fruit – which contains the seed wherein the cycle is renewed. So the Princesses, as Malkuth, have a special relationship with Kether and the Aces, and a relationship with Binah the Mother as the Princess ascends the throne to become Queen, and a relationship or duty with Chokmah, the Father and the Knight whose “eld” is awakened. She connects to all of the Supernal trinity of “Heaven” and also the solar center of Tipareth through union with the Prince, and yet is firmly planted on Earth. Between Heaven and Earth she stands. 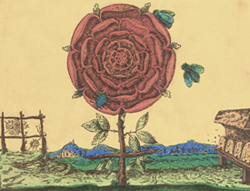 The red rose and the white lotus hint at alchemical processes, usually shown by roses either red or white. Roses and lotuses call to mind the roses and lilies often seen symbolically in Tarot such as on the Waite Smith Magician, who also in a sense is a conduit of the above and below. In the biblical Song of Songs 2:1 the bridegroom states “I am the rose of Sharon, and the lily of the valleys.” There are parallels between the rose in Western culture and the lotus in Eastern culture. In both cases their unfolding is a symbol of the soul’s evolution, of internal processes and potentialities of being. Like the Princess they symbolize the secret center which is at once a beginning and a perfection and completion. 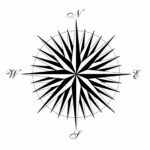 They also can symbolize a mandala of the directions, a compass once again bringing to mind the Princesses on the celestial map. What of the term “throne”, as in “throne of the Ace”? A throne is a seat of power. We normally think of it as an elaborate chair, the ceremonial seat of a ruler. 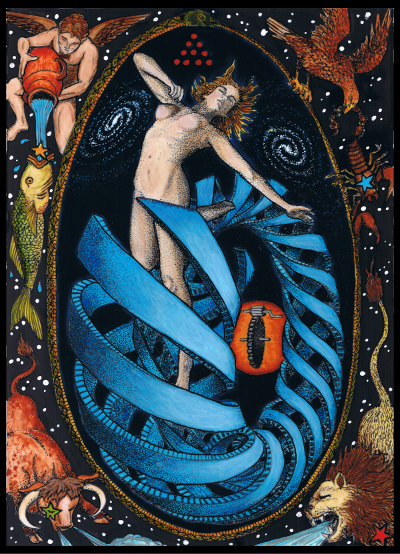 We could visualize the Ace as being held in the lap of the Princess, much as Kether is held up by Malkuth in a sense. But the word throne also refers to the authority and power of the sovereign office itself, as in “to address one’s pleas to the throne”. The word comes from a Proto-Indo-European root dher- meaning “to hold firmly”; which is also a root of the word dharma or” that which is established firmly”. (Woe unto whomsoever shall make war upon her when she is thus firmly established!) In a sense the Princess is the ultimate authority or custodian of the elemental power that was nascent in the Ace. The Princesses in the Golden Dawn tradition are shown standing alone, wearing little clothes or armor. There is a reason for that beyond titillation! They need no horse for momentum, no throne for stability, no chariot for power, and no armor for protection; their force, form and beauty are inherent within them. 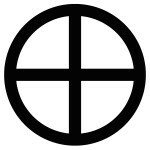 Book T and Liber Theta also give precise descriptions of each court card’s elemental crest. These crests are illustrated on every Tabula Mundi tarot court card and deconstructed and described in Book M: Liber Mundi. Consider this brief excerpt in relation to each Princess. The Princess of Wands has a winged tiger’s head as her crest, the tiger being a symbol of willpower, fiery sensuality, and courage. Indeed, her power is that of Fire, To Will. 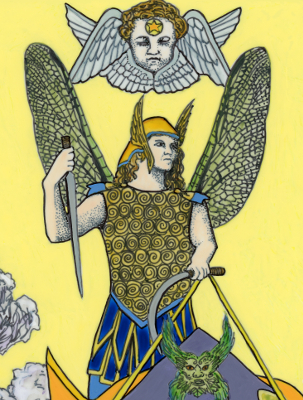 The Princess of Cups has the open-winged swan as a crest. The swan is a symbol of grace and beauty, purity and transformation. The power of the Water Princess is Love; To Dare. 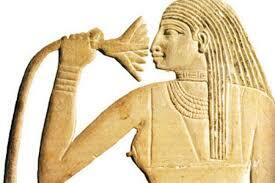 The Princess of Swords has as a crest the head of Medusa with serpent hair. 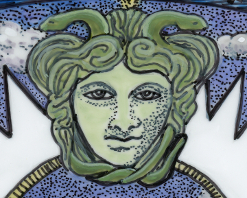 The Medusa head design was used by Athena as an aegis on an animal skin mantle, and sometimes on a shield. The Aegis implied divine birth or protection; doing something “under someone’s aegis” means doing something under the protection of a powerful, knowledgeable, and benevolent source. The name Medusa comes from the Greek word for “guardian, protectress”. The Princess of Air is the warrior of the mind, who battles delusion. Her power is To Know. The Princess of Disks has as her crest a winged ram’s head. 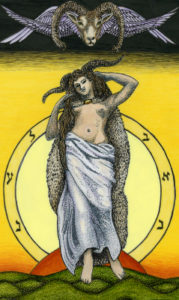 The ram is the symbol of Aries, and the stone of Aries is the Diamond, a connection with Kether. At first glance one might find this association with Aries as a crest confusing, as it is only a secondary quadrant of hers and her primary sign is Taurus. 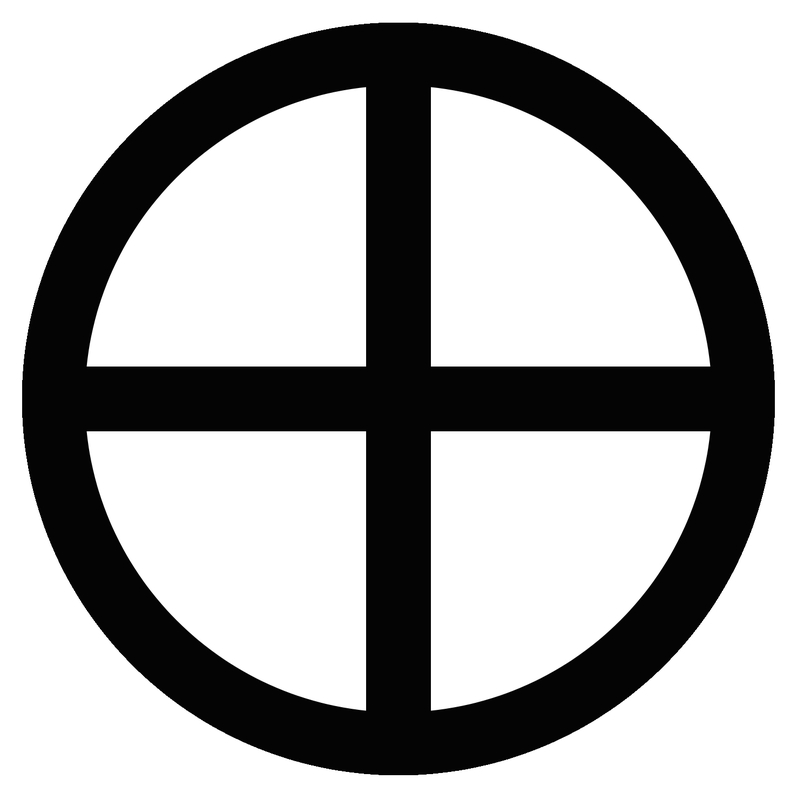 But it is a symbol of the renewal of spring over winter, the connection between the end and the beginning, similarly calling to mind the “double Mars” repeating planetary ruler in the zodiac wheel of the decanates. It is symbol of the masculine within the feminine. One may note that the shape of the womb is the shape of a ram’s head. This is a hint of her creative power and force. Khnum, the ram-headed Egyptian creator god, was said to have formed the entire Universe from a single egg. The ram’s head is also an inverted pentagram, the five pointed star of man, the significance of which will be seen when we review her relationship to the four powers of the sphinx. For hers is the final power of Earth, To Keep Silent, but is also the unity of all in the fifth power, To Go. 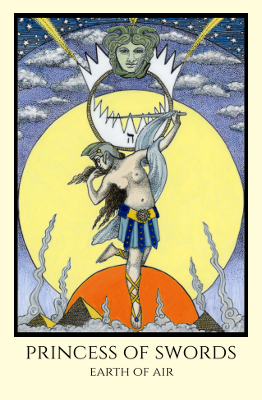 For Earth of Earth is the final card of the Tarot court, the ending that is also a beginning. I was so excited to read this! I love how you’re able to put things in such a way that I understand it so clearly. This was very important information and brought so much more into my view. How overlooked the Princesses are! I never realized this and she has been down played and obscured in so many other decks! You are so brilliant and I’m so thankful for you. Your creativity is beyond this world! And I love your idea of putting topics in a jar and drawing out one now & then! I’m always eager to read every thing you write and so glad I get your newsletter.